If you come home from work only to find a mess on the kitchen floor, you are dealing with a dog who loves raiding your garbage. The behavior comes from your pet’s ancestors who simply had to scavenge in order to survive. 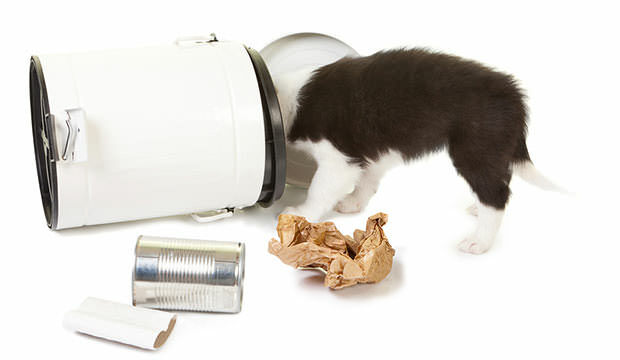 Apart from being messy, eating from the garbage can be dangerous. Your pooch might suffer gastrointestinal distress or damage. Dealing with this behavior can be tough and challenging, but with consistency, patience and delicious dog treats, success is just around the corner. When your dog goes into the trash can, clap your hands or blow a whistle. This loud noise will scare and startle him, and he will know exactly why. He will probably look at you and now that you have his attention, show him a dog toy, and when he shows interest in it, pet him and give him dog treats. Hopefully, with time, he’ll stop going in the trash to avoid the unpleasant noise. It is useful to feed your dog several small meals throughout the day so he’s not hungry and tempted to go looking for snacks in the trash. Spray some dog repellent on the trash can. The smell will keep him away from the trash. If that doesn’t help, sprinkle baking soda on top of the trash in the can. When your pooch tastes the baking soda, he won’t like it one bit and will stop raiding the trash. 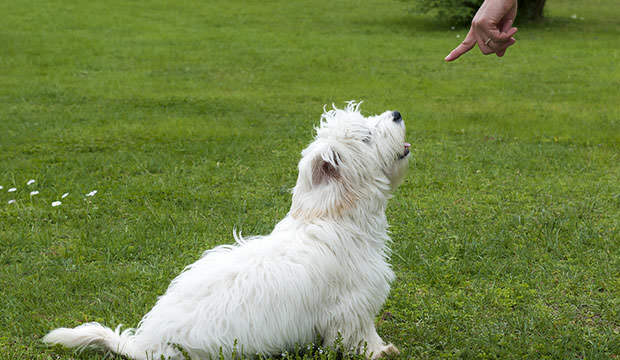 Work on obedience training in order to control your pet companion and keep him from misbehaving. Teach him basic commands, such as “sit” and “stay,” to keep him in an area away from the trash. Teach him the “leave it” command for situations when you catch him looking at the trash. Finally, if that doesn’t cut it, simply find a way to block your dog’s access to the trash can. Place the trash can up high where it is unreachable for him or put it in a cabinet secured with a child-safety lock. Good luck and be persistent. Old habits are indeed hard to break, and this one is millions of years old.